Parenting a shy kid? A computer geek? One who doesn’t get manners or know how to be friends? Starting to worry? Time to learn more. IMAGE FROM: Lets chat autism. Another useful resource to visit. 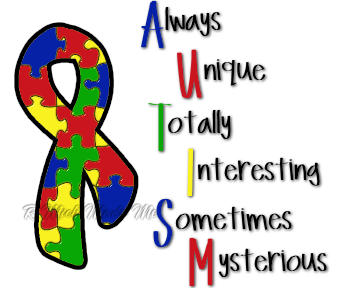 Autism is a group of developmental brain disorders. Symptoms and burden vary greatly. The term “spectrum” refers to the wide range of symptoms, skills, and levels of impairment. Some live relatively normal lives and others barely function beyond the level of a toddler. Aspergers is part of the spectrum or maybe not. The shrinks are debating. The numbers diagnosed with ASD or Aspergers seems to be growing, which makes more parents worry. The numbers may be growing only because of the growth of the psychiatric community which means many who had the disorder in the past didn’t get the label. There may also be more children burdened by ASD or Aspergers for reasons not yet understood. Either way parents with children marching to very different drummers worry. Behavior that is troublesome wherever the child goes — that is usually the first sign a brain glitch is part of the problem and not how the child is treated in different environments. Not one friend of his or her age. Bullied or isolated by peers. Differences make adults uncomfortable and children more so. For lots more information about autism, the USA’s National Institute of Mental Health provides this site. For a parent’s perspective go to Flappiness Is. Calum is a three year old, he has a five year old sister who is not autistic–what the autistic community calls neuro-typical. Their mother writes movingly about parenting both and her blog is a gift to those struggling to provide a good life for children challenged by this brain glitch. Tip one: Reading the resources suggested above is a good first step. Tip two: If you have already read about autism and Aspergers, and are still worried get competent professional help if you have not done so. Tip three: Strengthen your Emotional Fitness skills. Tip four: Find support so you can share your hopes, fears, dreams, slips, set-backs and success with others. This will help you and others. Helping others is practicing kindness and strengthens you and others. One way to practice kindness is by liking, commenting, or sharing my posts. I promise kindness is always rewarded in one way or another. Tip five: Read my next post – due Wednesday – as I will focus more on Aspergers and a bit on finding competent help. This entry was posted in Parenting Issues and tagged Autism, Challenged Children, dpchallenge, Emotional Fitness Training, Katherine Gordy Levine, Parenting advice, parenting tips, postaday, Practicing Kindness, When to worry. Bookmark the permalink.